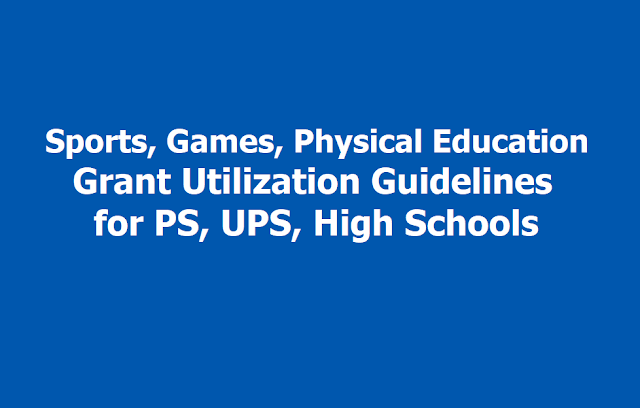 Sports, Games & Physical Education grant Utilization Guidelines for TS Schools and AP Schools: Suggested List of Sports Equipment for Class 1-5, for Class 6-8 and for Class 9-12). List of Sports and Games activities for Schools. 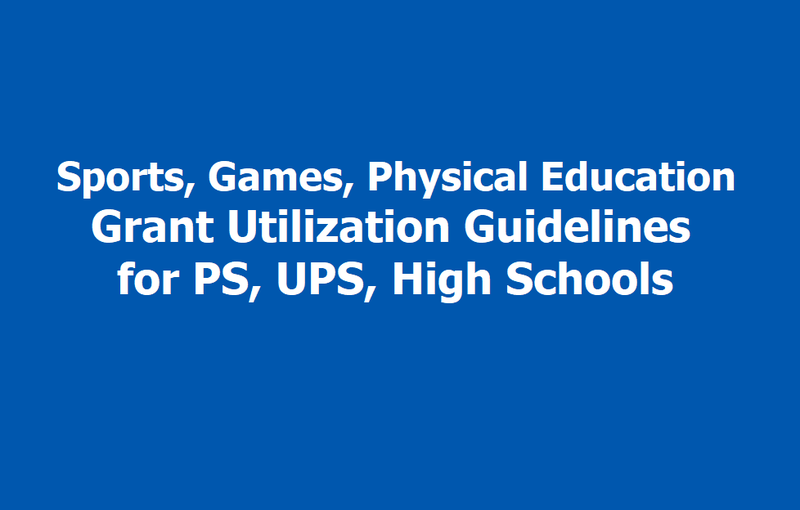 Guidelines for maintenance and the use of the sports equipment's. Govt. of India has communicated the guidelines, in order to ensure proper utilization of sports grant for Primary, Upper Primary, Secondary and Senior Secondary schools for meeting expenses on procuring sports equipment for indoor & outdoor games under the Samagra Shiksha. STATE PROJECT DIRECTOR, TSS,TELANGANA - HYDERABAD. Subject: TSS, Hyderabad - Release of Sports & Physical Education grant to Government & Local body and Model Schools in the State as recommended in PAB 2018-19 - Guidelines communicated - Regarding. The attention of all the District Educational Officers in the State is invited to the references read above and they are informed that the Govt. of India has communicated the guidelines, in order to ensure proper utilization of sports grant for Primary, Upper Primary, Secondary and Senior Secondary schools for meeting expenses on procuring sports equipment for indoor & outdoor games under the Samagra Shiksha (Details are provided below). Therefore, all the District Educational Officers in the state are requested to take necessary action as per the guidelines. (a) List of sports equipment - An indicative list of age appropriate sports equipments for government schools has been prepared and is at Annexure-I (Videos on the use of most of the recommended sports equipment is available on youtube). This however is only an indicative list and not an exhaustive list. The States/UTs may if they so desire, procure items from beyond this list subject to its actual requirement being certified by the head of school. However, the sport specific equipment’s and props may be chosen by the schools, based on availability of infrastructure in the school including availability of playfield etc. Schools may also be encouraged to include traditional /regional games of the respective State/Region, the low /no cost equipments may be procured at loca1 level for these sports/games. The State & UTs will also need to maintain the sports equipments and have them in a workable position. For this periodic review maybe done and record be maintained of workable equipment, repairable equipment, write off equipment and new items to be purchased to maintain the required stock. (b) List of sport Activities - An age appropriate suggestive list of sports activities for the Government schools of States/UTs is also attached at Annexure-II. (c) Stock Maintenance of sports Equipment - one responsible person/PET/Teacher In-charge may be given the responsibility to take care of the equipments and to maintain the stock the stock position of sports equipments in the school. Detailed guidelines for maintenance and the use of the sports equipments is at Annexure-III. The said Annexure also includes instructions for maintaining safety at playgrounds with adult supervision. a. Ball Badminton, Handball, Hockey, Karate, Sepaktakraw, Wrestling, Sqay, Kalarippayattu, Ice Hockey, Kick Boxing, Thang TA, Yoga. Other minor sports include Ilavatta kal where children lift huge spherical rocks, Gilli-danda played with two pieces of sticks, Nondi played by folding one leg and hopping squares. Some of the indoor games include Pallanguzhi involving beads, Bambaram involving spinning of top, Dhayakattai which is a modified dice game, Aadu puli attam, Nungu vandi and Seechangal. Mainstream Games (apart from Athletics, Gymnastics and Swimming) can be divided into three broad categories namely territorial, net/wall and striking & fielding. Striking and fielding games are those in which two teams compete within an area that offers possibilities for offensive and defensive plays. The goal for the batting team is to strike an object, usually a ball so that it eludes defenders/fielders. Scoring is achieved when a batter makes a successful run round the bases. The goal for the fielding team is to prevent the batting team from scoring runs. Cricket is one of the suggestive strike and field game. Soft Tennis, Athletics, Atya Patya, Badminton, Basketball, Boxing, Chess, Cycling, Football, Handball, Hockey, Judo, Kabaddi, Karate, Kho-Kho, Netball, Mallakhamb, Lawn Tennis, Roller Skating, Rugby, School Games, Softball, Squash, Table-Tennis, Tug of War, Volleyball, Weight- lifting, Wrestling, Kalarippayattu, Cricket, Netball, Yoga, etc. Soft Tennis, Athletics, Atya Patya, Badminton, Ball Badminton, Baseball, Basketball, Billiards & Snookers, Body Building, Boxing, Bridge, Chess, Cycling, Football, Handball, Hockey, Judo, Kabaddi, Karate, Kho-Kho, Netball, Mallakhamb, Lawn Tennis, Para Sport, Roller Skating, Rugby, School Games, Softball, Squash, Table-Tennis, Volleyball, Weight-lifting, Wrestling, Kalarippayattu, Cricket, Netball, Kick Boxing, Yoga, etc. The success of a sports facility is decided by its usage. For the facility to be popular it needs to be well equipped and maintained. d. Maintain cleanliness of pitch and its surroundings. f. Periodically check the maintenance of goal posts, volleyball poles, basketball post, etc. 1. Inflate balls to correct pressures. 2. Before you inflate the balls moisten the needle. 3. To inflate balls, squeeze balls while gradually adding a small amount of air at a time. 4. Inflating balls with too much air at once will damage the inner tube/ bladder. 5. Avoid inflating balls with machines as it may over inflate. 2. Wipe the surface with a soft cloth. 3. If you are unable to remove dirt easily, wipe balls with a moistened cloth. moistened with water-diluted mild detergent. 5. If you use mild detergent to clean balls, thoroughly wipe off any remaining detergent to ensure that it does not remain on the ball surface. (detergent may cause stain). 6. Wipe the ball afterwards with a dry cloth. 7. Dry balls out of direct sunlight in a well-ventilated place. Do not keep it under direct sunlight for long. 8. If the ball has been soaked by rain, wipe away moisture and dirt using a cloth. Dry the ball out of direct sunlight in a well-ventilated place. 1. Avoid leaving balls in a place that is exposed to direct sunlight. 2. Avoid storing balls in hot or damp places. 3. Store balls in a well-ventilated place. 4. Inflate balls regularly and store them in a well-ventilated place out of direct sunlight. 1. After the activity, use a dry cloth to wipe the props/ equipment and store in a well-ventilated place out of direct sunlight. 2. Check the condition of the props/ equipment regularly to avoid using a damaged prop. 3. Do not leave the props/ equipment in direct sunlight for the whole day. It would reduce the life of props/ equipment. 4. Do not store the props and equipment made of iron/ metal in a damp place. The moisture may lead to rusting. 5. Do not apply water on any leather props and equipment. Always use dry cloth to clean. Safety at playground or sports ground is achieved by establishing a balanced approach to providing good equipment, good practice and good management. Maintaining records of incidents and circumstances which have potential to cause accidents, remedial actions to be taken and monitoring the implementation of safety guidelines will ensure safe conditions for the children to play. Playgrounds and outdoor play equipment offer children fresh air and proper exercise. So it is important to make sure that faulty equipment, improper surfaces, and careless behaviour do not ruin their interest in going out and playing with other children. You can keep the playground entertaining and safe by checking equipment for potential hazards and following some simple safety rules and guidelines. Adult supervision can help prevent injuries by making sure children properly use playground equipment and do not engage in unsafe behaviour around it. If an injury does occur, an adult can assist the child and administer any needed first aid right away. Do not leave children unattended at any point of time. The most important factors in evaluating the safety of any playground are proper surface, design and spacing, and equipment inspection and maintenance. A proper playground surface is one of the most important factors in reducing injuries and the severity of injuries that may occur when children fall from equipment. a. Concrete, asphalt, and blacktop are unsafe. Grass, soil, and packed-earth surfaces are safe because these can cushion a fall. b. The playground surface should be free of standing water and debris that could cause children to trip and fall, such as rocks, tree stumps, and tree roots. c. There should be no dangerous materials, like broken glass, nails, erected rods and twisted metals. d. Check the playground/ activity area in advance and remove the dangerous items from the ground. e. Surfacing mats made of safety-tested rubber or rubber-like materials are safe. f. Rubber mats allow the best access for infants and primary students. g. The cushioned surface should extend at least 6 feet past the equipment. Additional coverage may be needed, depending on how high a slide is or how long a swing is. h. Equipment with rounded edges are safe and not the angular edges. i. Keep first-aid kit available close to the playground. k. There should be no broken equipment and props. l. Wooden equipment should not be cracked or splintered. m. Metal equipment should not be rusted. n. Children should be aware of the unsafe and dangerous areas/ locations, if any. o. Surface materials on the playground should be maintained regularly so that the surfacing is loosely packed and covers all appropriate areas — especially the fall zones surrounding playground equipment. p. Playground equipment should be made of durable materials that would not fall apart or worn down too much by the weather. q. Make sure that there is enough clearance in front of equipment like slides, swings, etc. And children do not linger around when equipment is in use. r. Check for objects (like hardware, S-shaped hooks, bolts, nails and sharp or unfinished edges) that stick out on equipment and could cut a child or cause clothing to becomeentangled. s. All hardware or equipment should be secure, with no loose or broken parts. Plastic and wood should show no signs of weakening, and there should not be any splintered or rustedsurfaces. t. If the local playground has a sandbox, check for hazardous debris such as sharp sticks or broken glass, and be sure that the sand is free of bugs. Sandboxes should be covered overnight to prevent contamination from animals, such as cats and dogs. u. Help keep your playground clean and safe by picking up trash, using the equipment properly. Report to higher authorities for any problem immediately related to safety. v. If a part seems broken, loose, or in need of maintenance, designate it as off-limits immediately; report the problem to the appropriate authorities and follow up for completion. You must know how to be safe and act responsibly at the playground. i. Never push or roughhouse while on jungle gyms, slides, seesaws, swings, and other equipment. ii. Use equipment properly — slide feet first, don not climb outside guardrails, no standing on swings, etc. iii. Make sure that there is enough clearance in front of equipment like slides, swings etc. and that children do not linger around when equipment is in use. iv. Always check to make sure no other children are in the way if they're going to jump off the equipment and land on both feet with their knees slightly bent. v. Leave bikes, backpacks, and bags away from the equipment and the play area so that no one trips over them. vi. Always wear a helmet while riding a cycle/ bike. vii. Never use playground equipment that are wet because moisture makes the surfaces slippery. viii. Check playground equipment in the summertime. It can become uncomfortably or even dangerously hot, especially metal slides, handrails, and steps. So use good judgment — if the equipment feels hot to the touch, it is probably not safe or fun to play on. Contact burns can occur within seconds. ix. Wear clothes that do not have drawstrings or cords. Drawstrings, purses, and necklaces could get caught on equipment and accidentally strangle you. x. Wear sunscreen when playing outside on sunny days to protect against sunburn. a. More budget may be allocated to Primary School as children would be learning skills at that age and would need more practice with equipment. The ratio of children to equipment should be 1:4 at this age. b. Upper Primary/HSC & SSC would be using almost same equipment (sport specific). These two categories can be clubbed together. c. To ensure optimum utilization, equipment stores should be close the play field. d. Use of technology/ APP for imparting knowledge to PE Teachers on the usage of sports equipment may be explored.